Kranji War Cemetery, Plot 32, Row C, Grave 13, Age 23. Millhouse enlisted 23 September 1941 and joined 2/4th reinforcements ‘E’ Company. ‘E’ Company ran in a Japanese ambush on 11th February 1942. About 88 of 200 men survived. Wounded in action South-West Bukit Timah receiving four gunshot wounds to the right leg. Missing in action from 11.2.1942. 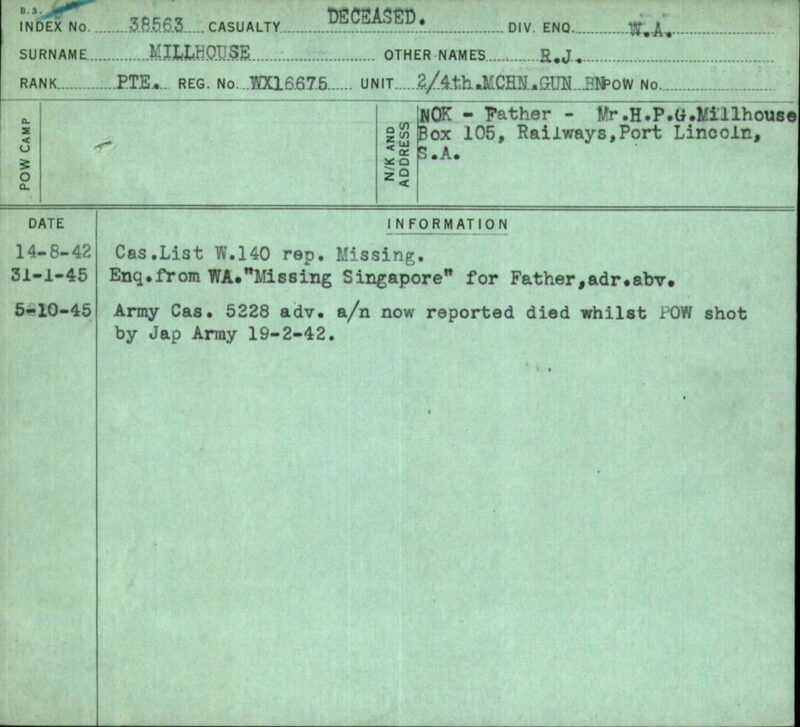 Executed by a Japanese firing squad for no apparent reason at map reference 753097. R.S.M. Airey who survived the firing squad wrote of Pte. Millhouse that he thought him gallant to the last as he let his executioners know exactly what he thought of them with his last breath of life.